I needed a quick cosplay I could create for a group of three girls. What's more awesome (and easy) than Power Puff Girls!! But after some thinking, unless the real people have giant heads and short bodies, it just wont look so cool cause it's just a tube dress. So let's go with the japanese version that as a little more details and is at least it's more distinct. Power Puff Girls Z BELT! Created the coloUrful embellishments from the foam clay I use a lot. I cut out elongated 'D' out of craft foam and created the belt band out of the waist band elastics. It's really big because it hangs loose on the girls. 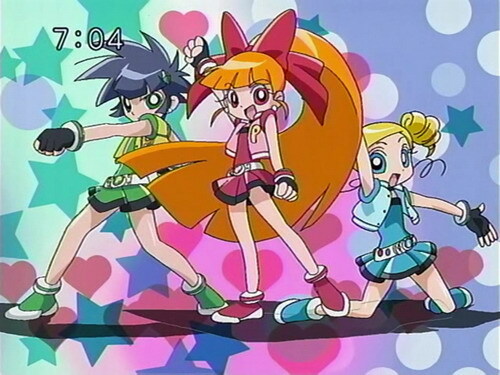 Power Puff Girls Z GLOVES! Snip off the finger tips and dab on the nail polish. The Nail polist will clot the fabric so it won't fray. It's a little crunchy so a little itchy, but eh we won't be wearing this on a daily basis. Ok I know I know, where is the white band. Well cost savings analysis I decided not to do it. People wno't miss this kinds of details. But for those who want to know how I would do it anyways. Glue the cuff of the glove (with hot glue) to the inside of the bangle.